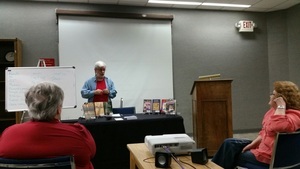 The Rabun County Public Library hosted local author John Shivers on Thursday April 21st for a book reading and signing event. John visited the library to discuss his many books, including a newer mystery release inspired by Rabun County, titled Boat Load of Trouble. This new mystery follows Mags, a mountain real estate agent turned sleuth with the untimely discovery of a dead body aboard a ship, and the confusion and desperation that ensues. After his reading, John spoke with attendees about his writing process and where exactly he gets his inspiration, though that secret is only known to those who attended. All the participants joined in for a character development activity, led by John. The group worked together to choose different character attributes and, based on those choices, developed a back story for their character. It was a great learning experience for those who attended, and many are excited at the release of his new mystery, Boat Load of Trouble. 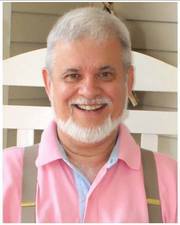 John Shivers is a local author that has been writing for the Laurel since 2007. He began publishing at age 14 with a weekly column in hometown newspaper, The Calhoun Times, and at age 22, he was appointed to his first editor/publisher job as the youngest in the state. He is also the winner of 16 press association awards in three states, the co-founder of regional magazine Conasauga in 1979, and has published more than 40 publications since 1987. To view more upcoming events at the library, feel free to take a look at their calendar.